Now I bet your wheels are turning about all the tactics you use when link building: advanced and scalable prospecting techniques, best practices for email outreach, vetting link prospects, etc. How can you use all of these techniques to your advantage when it comes time to recruit for your team? I’m going to share with you a few tactics that have been particularly helpful for identifying potential candidates for the Seer digital marketing team. One standard way that you might prospect for link opportunities is through the use of advanced search queries in Google, and it’s really no different when it comes to sourcing candidates. 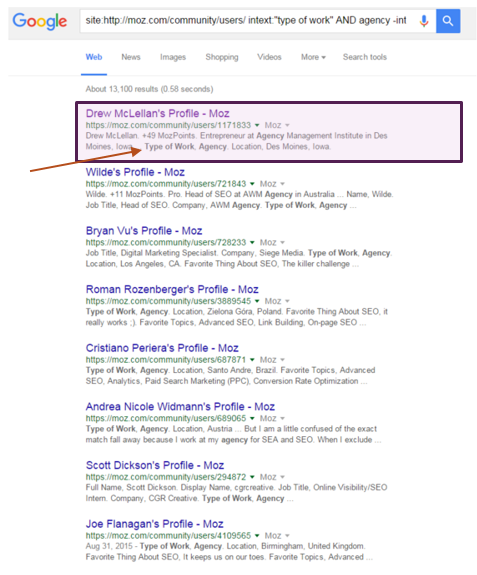 Assuming you’re searching for marketing-savvy candidates with agency experience, Moz’s website would be a great place to start testing advanced search queries. If you wanted to source candidates from Moz’s user-base, for example, you could develop an advanced search query to find all potential candidates that fit your criteria. When using this advanced query: site:http://moz.com/community/users/ intext:”type of work” AND agency -intitle:agency, Google will return results showing Moz Community Members who work at agencies. You can continue refining your query to drill down into deeper specifics such as location, their “level” (aspirant, oracle, etc. ), or favorite topics. Google isn’t the only place you can put advanced queries to work. If, for example, you’re looking for someone who has agency experience in SEO and content marketing, with a specialty in blog content, the following query might result in relevant candidates: “SEO” AND “agency” AND “content” AND “blog” AND “campaign” -seer. 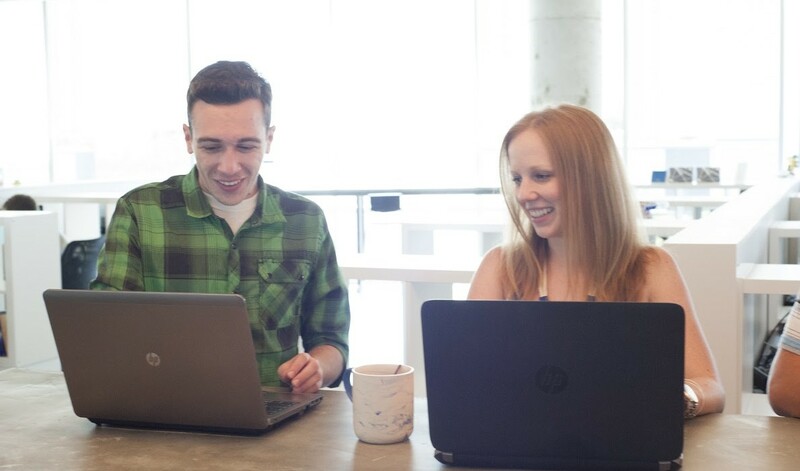 Bonus tip: if everyone on your team enters the same query into LinkedIn, you’ll have an even larger list of 2nd and 3rd connections to vet through. To easily gather the candidates from LinkedIn’s SERPs (and avoid copy and pasting or typing names into an email or spreadsheet), simply use the Scraper Chrome Plugin to scrape the names and URLs of the results into a Google doc to get an instant prospect (a’hem, “candidate”) spreadsheet! Shout-out to Lauren Boyd from our people team for seeding this idea! If you haven’t signed up for Klear, you won’t be able to search for your username. Instead, enter your Twitter username manually into your browser following this pattern: http://klear.com/profile/username (…or just sign up for Klear!) Next, view the “Talked with” report. Then, from here you can view various people you’ve had conversations with that maybe you’ve forgotten about, or never thought of as a candidate in the past, but could be a potential candidate now. 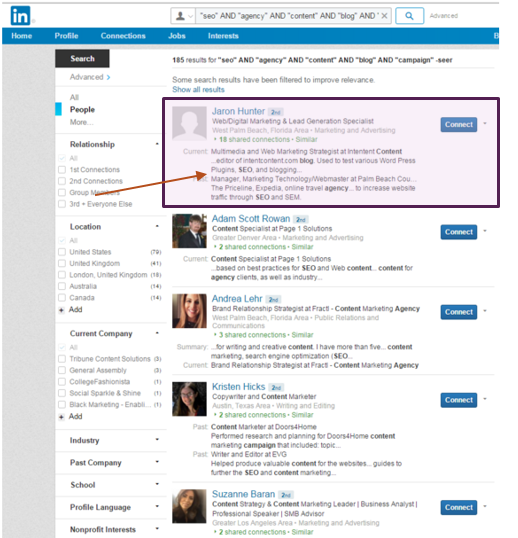 Another way to use the “Talked With” report is to find a group of potential candidates who are connected to each other. This is especially helpful if you’re not terribly active on Twitter or aren’t active in the particular niche for which you’re trying to hire within. For example, enter in a user who represents an ideal candidate (maybe it’s one of your own existing rockstar employees or a thought leader within that niche) and view their “talked with” report. You’ll get an idea of the type of people who hang in the same circles as that person and talk about similar industry-related topics which gives you a pool of relevant candidates. 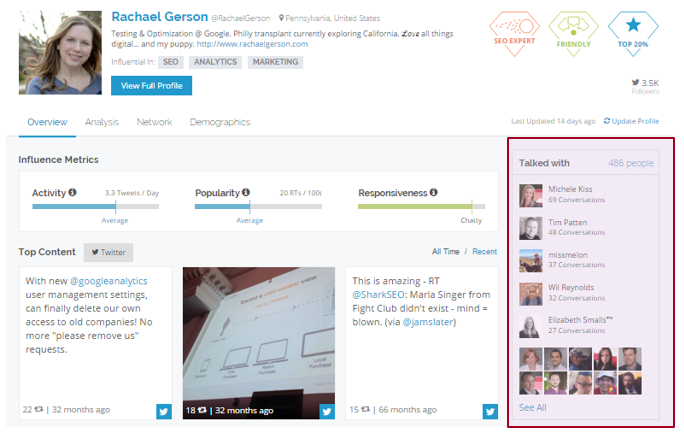 When viewing your profile, you can see your top tweets, i.e., your most retweeted posts. Check out the people who retweeted that top content! They likely already know who you are, trust you, and think highly enough of you to retweet your content. Click on “stats” which will bring you to a list of people who retweeted that content. 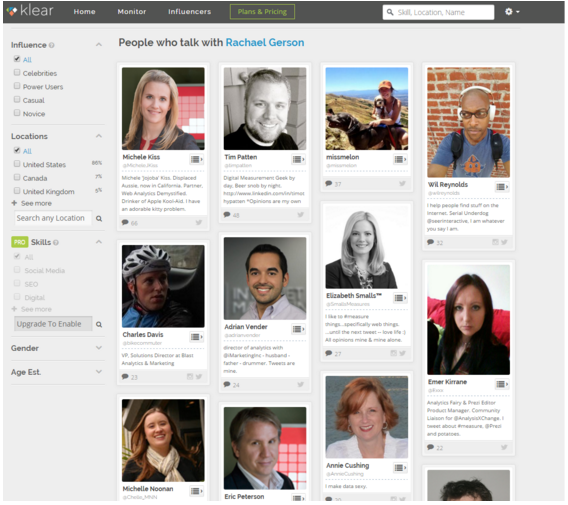 This is another list of people who are already engaging with you and could be potential candidates for your team. Remember, if you aren’t active on Twitter you can review Klear profiles for industry influencers who regularly produce content and interact with other digital marketers. Are you starting to see how this can lead you down a rabbit hole of sourcing? 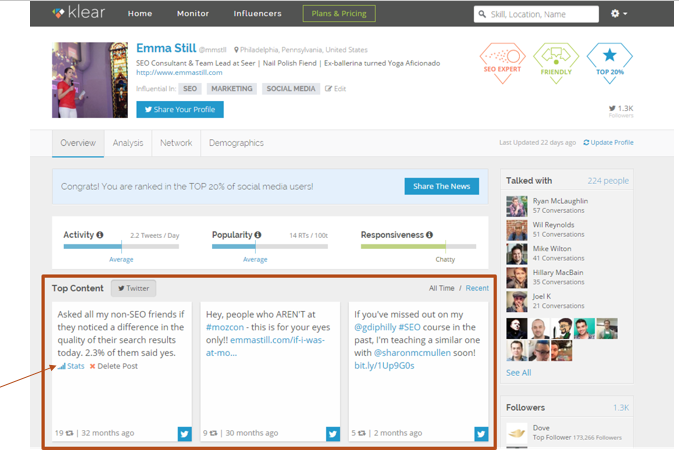 Buzzsumo is a search tool that allows digital marketers to find content that is currently trending on social platforms: Twitter, Google+, Linkedin, and Pinterest. This is a great tool to use to identify marketers who are sharing content about your industry – and on subjects that are in-line with your team’s strategy and values. Review the content you’ve shared that is relevant within your industry, share your company’s philosophy, align with your overall marketing vision. View “other sharers” of those articles. This shows people who are familiar with the content topic, are interested in it, find it valuable, and share similar philosophies as you. Rinse & repeat this process by entering other employees, your company’s Twitter handle, or an industry account you admire to gather even more potential candidates. 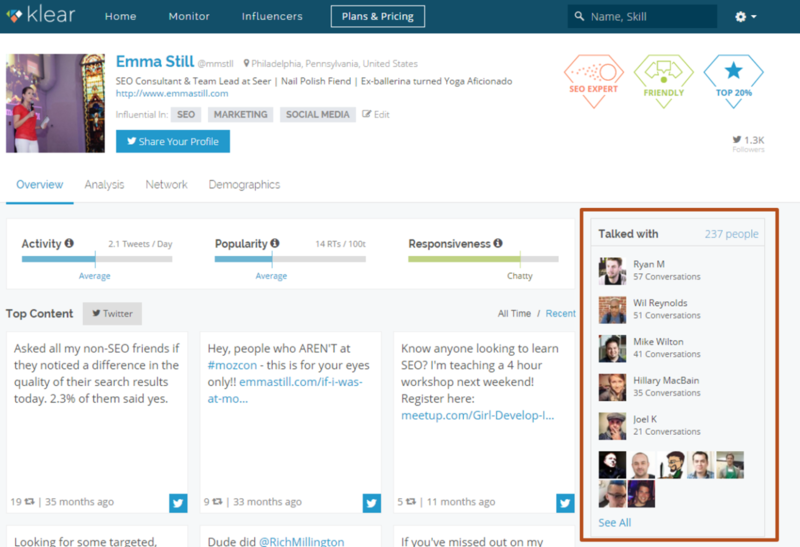 You can even filter the “other sharers” by level of influence, location, etc. to get more specific. Similarly, check out some of the top articles that you’ve shared and see who wrote those articles. These are the people who are thought leaders within the industry, you respect their views and opinions, and could be a match for your team as well. Lastly, perhaps one of the simplest methods to utilize your Twitter network is just by using Twitter interface and your email. Review your own followers: you can export your Twitter followers through a tool like followerwonk. Once you’ve exported the data, you can filter your twitter followers by their bios. For example, the tool can compile of list of your followers who have certain words in their bio, such as “SEO” or “digital” or “email”, etc. You can further qualify your candidate list by filtering by the number of followers they have or by location. Additionally, you can repeat this process by analyzing an account that may be popular in the industry or niche, whether it’s a relevant publication or an industry thought leader. Lindsay is already an SEO account manager at Seer, so naturally we’d want to check out her Twitter suggestions for similar users. This is an easy and simple way to find potential candidates without devoting a ton of time on sourcing. Hopefully these tips have given you a fresh perspective on how to apply tools and methodologies that you utilize on a daily basis to help recruit new digital marketers to your team. Now’s the time to use them to bring the right people on board! Have you used any of the methods above for recruiting? Got any other creative recruiting techniques? I’d love to hear about them in the comments below!